Update: And the cheeky gambit paid off: Nokia's sardonic thank you tweet received over 38,000 retweets which, a Twitter insider says, makes it one of the top marketing tweets in the history of Twitter. Nokia UK was quick to joke on Twitter about the latest iPhone 5C being an 'imitation' of its bright Lumia phones. 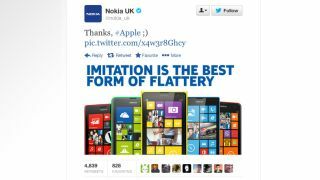 Within minutes of the announcement of the iPhone 5C and iPhone 5S, Nokia UK's official Twitter feed posted a cheeky message aimed squarely at the Cupertino company. Obviously the tweet was timed to pick up some free publicity from the stream of Apple tweets as its launch event took place - and given that we've written about it, it's clearly worked. Nokia's mobile arm was recently snapped up by Microsoft, with chief executive Stephen Elop moving back under the Microsoft umbrella. Apple's iPhone 5C is a plastic version of the iPhone 5, aimed at the more budget end of the market and it is likely to be a competitor with many of the Lumia range. Good natured rivalry or real fear of competition? Whatever the case, there's no denying that a real rivalry has already brewed and is now going public.